General Dynamics Ordnance and Tactical Systems – Canada’s (GD-OTS Canada) expertise with production pouring and casting of TNT based explosives dates back to World War II and covers the filling of different calibers of fragmentation projectiles and shaped charges. 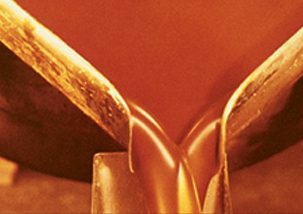 GD-OTS Canada also developed expertise Dinitroanisole (DNAN) based less sensitive melt pour high explosive formulations since 2002. Two melt pour explosives production lines facilities are available. One facility used for 81mm and above projectiles caliber is equipped with melting and a holding kettles with 200 US gallons capacity along with a melting/holding kettle of 200 US gallons for smaller charges. Ten production stations, each able to handle twenty-three 120mm caliber and below projectiles or ten 155mm M107 shells, are equipped with probe and coils systems as well as water bath to perform cooling operation enabling defects and rejects incidence close to six sigma level. The second facility is used for high rate production of munitions with calibers up to 81mm. Two 180 US gallons kettles can be used in parallel for munitions filling. A tunnel fitted with one section for warm air heat pre-conditioning of projectiles and one section for cooling using circulating water and air is used in this facility. All this equipment is fitted with probes for data acquisition used in statistical process control (SPC). The cooling step in both facilities is automated to provide a better control of this critical operation. In addition, GD-OTS Canada also has a pilot plant laboratory equipped with a 20 US gallons kettle and a cooling station very representative of the production equipments. The use of instrumented shells and cooling station hooked up to data acquisition system enables the study of the cooling behavior of the cast explosive in the different shell designs. 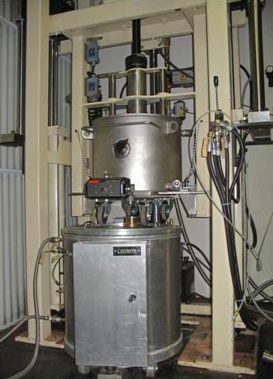 This equipment is used to optimize the pre-heating and cooling processes to make them more robust for new products and type of explosives through design of experiments. Computer simulations of the process can also be run to improve the knowledge and orient the work at the beginning of the filling method development or to improve it if required. General Dynamics Ordnance and Tactical Systems – Canada’s (GD-OTS Canada) involvement with Insensitive Munitions (IM) including ignition systems, propulsion systems and high explosives dates back to the 1980’s. General processing expertise was developed in the area of cast-cure Plastic Bonded Explosives (PBX) based on nitramines (RDX and HMX) in a polymeric binder with Canadian, American, British and French formulations. Work on this type of explosive can be performed in either our laboratory 2 US gallons or pilot plant 10 US gallons planetary type mixers and ancillary equipment to mix and cast PBX formulations under vacuum for conventional batch type processing as well as in a bi-component processing equipment based on a static mixer. GD-OTS Canada experience with TNT based explosive was extended to include melt pour insensitive high explosive such as different types of di-nitroanisole (DNAN based) formulations (PAX-21, IMX-104, PAX-48, OSX-12). In addition, pressing of boosters of different sizes has been performed with less sensitive PBX formulations such as PBX-5, PBXN-9 and PBXW-14. Expertise in the area of LOVA propellant covers charge design based on XM-39 ad similar formulations of propellant and Pyrodex based primer. GD-OTS Canada is equipped with computer simulation tools and transparent gun simulator to optimize propellant charge design. Packaging is an important part of insensitive munitions and this expertise is being developed presently at GD-OTS Canada through cooperation with packaging suppliers. While IM testing is generally subcontracted to other facilities, GD-OTS Canada is currently developing its expertise in this area. Bullet impact and sympathetic detonation can currently be conducted by GD-OTS Canada personnel. GD-OTS Canada’s past expertise in this area was acquired with 57mm Pre-Fragmented High Explosive (PFHE) and 105mm tank Multi-Purpose High Explosive (MPHE) rounds. The 120mm mortar development of enhanced insensitive munitions with a cast cure explosive formulation has been achieved successfully with the US Army and other companies leading to the qualification of the M934A2 ammunition. Work is on-going on the qualification of a 105mm PGU IM ammunition under contract from US SOCOM. GD-OTS Canada showed its capabilities to load, assemble and produce 60 and 81mm mortars using IMX-104 explosive as well as the 120mm IM HE-T with PAX-48.